Chris Lavoie shot 76 and finished tied for first place at the Division 2 South Sectionals earning co-medalist honors and a trip to the state finals at Marshfield CC. As a team the Bulldogs finished 10th. Mike Leonetti- 84, Thomas Singleton- 88, Conor Hunter- 90. Chris Lavoie fired an even par 34 to lead the Bulldogs to a big Davenport division win over Sharon at Blue Hill CC 149-154. 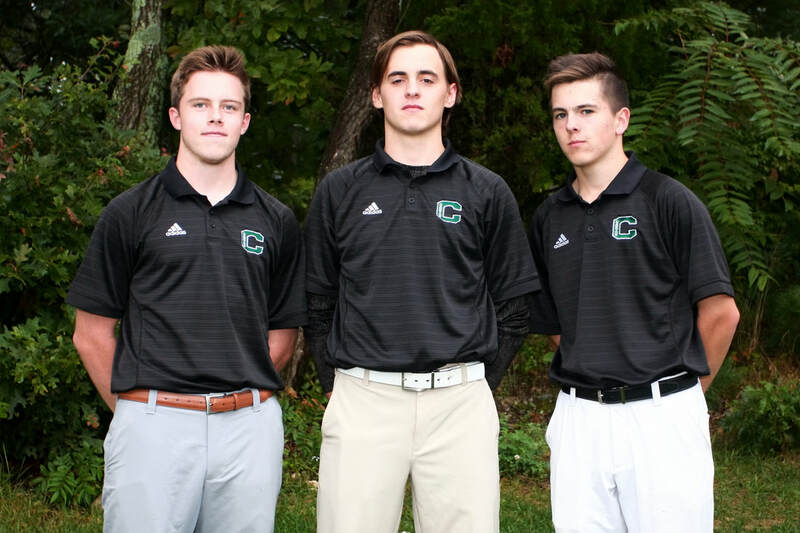 Tommy Dimock shot 37, Thomas Singleton shot 38 and Conor Hunter shot 40 in the win. The Bulldogs lost on the road to Sharon 161-153. Chris Lavoie had the low round for Canton shooting a 38. Tommy Dimock and Mike Leonetti both shot 40. Chris Lavoie and Thomas Singleton were co-medalist both shooting 37 in a 154-156 win at home vs North Attleboro. Tommy Dimock, Mike Gobbi and Mike Leonetti all shot 40 in the win. The Bulldogs won a close match at Franklin CC beating the previously undefeated Franklin Panthers 164-167. Thomas Singleton was match medalist with a 39. Tommy Dimock and Mike Gobbie both shot 41. Chris Lavoie shot 43 in the win. Four scores under 40 led the Bulldogs to a home win against Stoughton 147-184. Tommy Dimock was match medalist with a 35. Mike Gobbi and Mike Leonetti both shot 37 and Thomas Singleton shot 38. Tommy Dimock shot a 40 at Foxboro CC to help the Bulldogs win 270-273. The match was tied after 5 cards and the Bulldogs won on the 6th card. Other scores in the match: Thomas Singleton- 45, Mike Gobbi- 46, Mike Leonetti- 46, Andrew Middleton- 46 and Conor Hunter- 47. The Bulldogs lost a close match to King Philip at Wentworth Hills CC 169-168. Freshman Mike Leonetti was co-medalist with a 39. Bulldogs move to 3-0 with a 155-160 win vs North Attleboro at Heather Hills Country Club. Tommy Dimock was match medalist with a 38. Chris Lavoie, Mike Gobbi and Thomas Singleton all shot 39's in the win. Chris Lavoie shot a one over 35 to lead the Bulldogs to a 155-172 win at home vs Foxboro Tommy Dimock shot a 38. Mike Gobbi shot a 39. Matt Martin and Thomas Singleton shot 43's. The Bulldogs won their first match of the season 161-170 vs Milford at Hopedale Country Club. Thomas Singleton was match medalist with a 38. Chris Lavoie and Mike Gobbi both shot 41 and Tommy Dimock shot 42.